Five Gurkhas (Maj Rambahadur Pun, Capt Matthew Addison-Black, CSgt Prakash Gauchan, Sgt Kumar Rai and Sgt Resham Thapa Magar (QG Signals) currently serving on Op TORAL in Afghanistan organized a G200 Charity Event at Camp Qargha, Kabul on 28 and 29 May 15 with an aim to raise funds for the victims of Nepal Earthquakes. It was also to increase awareness of both the Brigade of Gurkhas and the Gurkha Welfare Trust for the bi-centennial anniversary of Gurkha service to the crown. The event was conducted in two phases: in the evening on 28th of May, Maj Ram Pun and Capt Matthew Addison Black gave a presentation about Gurkha history and the Gurkha Welfare Trust to a large audience of both officers and other ranks including Brig CST Page. This was then followed by a Raffle draw with a number of attractive prizes including the top three prizes of Khukuris proved to be a highly entertaining. 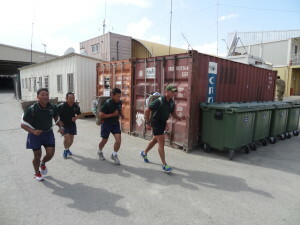 On the morning of 29th of May, we organised a Doko relay race to let the multinational armies (including Danes, Australians, Kiwis and Norwegians) gain a taste for the robustness of Gurkha Selection. 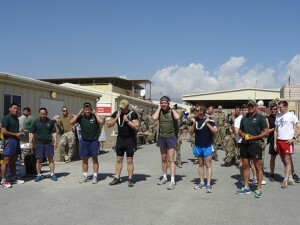 To start, Brig Page, Maj Ram, Lt Col Dallon and RSM Jefferies led the opening lap of the camp carrying the 25 kg Dokos. After the opening lap, the relay race began in full swing. Due to the overwhelming help and support from everyone within camp Qargha, we managed to achieve 200 laps, a total of 164 km at 6000 feet above the sea level. The event proved to be a huge success and was well supported by all of the Resolute Support personnel. It was an excellent turnout with a sparkling environment. With online donations and cash donations, we managed to raise a staggering total of £2590 surpassing our overall financial goal increasing awareness of our Brigade and most importantly our effort from the Op theatre to help the people in Nepal in conjunction with the GWT’s efforts.